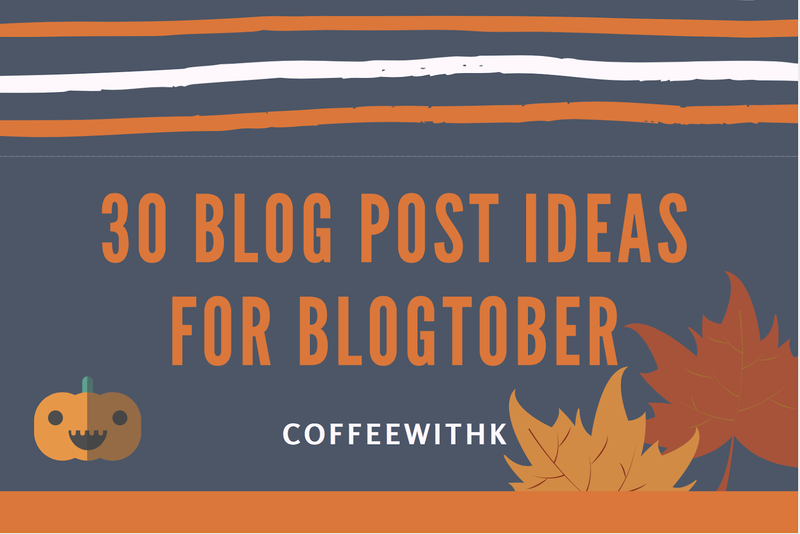 I thought one of the best ways to kickstart Blogtober would be give you all some ideas on some blog posts you could write in the case you are also taking part or would like to join! I know that I googled a lot of ideas and gathered some different ones up – some that I may be doing and some I won’t be! 1. Autumn Make-up Look – share your favourite or try out a new Autumn make-up look on your blog! 2. Spooky Halloween Stories – Perhaps some personal scary stories you’ve witnessed or your local town / cities ghost stories. 3. 10 things you love about Fall / Autumn and maybe 10 things you hate. 4. Your go-to Autumn cosy sweaters. 5. Halloween / autumn recipes. 6. Your top favourite coffee shops in your area. 8. A Get to Know Me Post – answering questions! 9. Your favourite editing apps to edit your photos. 10. What or who is your biggest motivation? 11. Your travel bucket list. 12. Things to do on a rainy / cold day indoors. 14. A book review on a recent book you’ve read. 15. Your favourite Halloween / Fall memory. 16. A shoutout to your favourite bloggers at the moment. 17. A collaboration with a fellow blogger. 20. How to keep organised with your blog and social medias. 21. Your favourite Instagram accounts. 23. Write a letter to your younger self – what would you tell yourself? 24. Write a letter to your future self. 25. A list of any local events happening in your area that month. 26. A day in your life. 27. A Halloween get-ready-with-me tutorial. 28. Budgeting tips and tricks. 29. What goals do you want to achieve by the end of the year? 30. Things to do in your area. I hope you take some inspiration in some of these blog post ideas, but there are loads more you can find online or even make up on your own! There are no rules on what you can or can’t write, so blab away until your heart is content! Thank you so much for reading!